Aimed at arable farms, speciality crop growers and contractors, the new John Deere R4040i self-propelled sprayer replaces the current 5430i model for 2015, and is designed to provide improved performance, increased uptime and significantly reduced cost of operation. The sprayer will make its public debut in the outdoor demonstration area at the 2014 CropTec event on November 19 and 20 at the East of England Showground, Peterborough. The R4040i is powered by a 6.8-litre John Deere PowerTech PSS engine producing 235 rated hp (boosted to 255hp with intelligent power management/IPM). This new engine meets Stage IV/Final Tier 4 emissions regulations by incorporating selective catalytic reduction (SCR). The machine’s centrally located cab, which is now easier to access, provides a comfortable operating position and offers good visibility both on the road and in the field. It also has a restyled interior with a new cornerpost display. The sprayer chassis features XtraFlex dual-strut independent wheel suspension for a smoother and faster ride, and hydraulic track width adjustment as standard. Hydrostatic final drives and planetary gears provide constant four wheel traction in both transport and spraying modes, at up to 40 and 20km/h respectively. 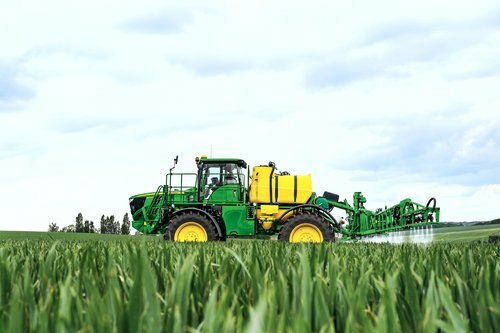 The sprayer can be operated with two-wheel, four-wheel or crab steering to suit different crop and field conditions, and has a 4.5m turning radius. The R4040i is also equipped as standard with the John Deere GreenStar 3 2630 touchscreen display with full FieldDoc spray documentation and ISOBUS compatibility. The sprayer comes AutoTrac ready and with a free JDLink Ultimate subscription for one year, which enables a range of additional FarmSight precision farming solutions including new Remote Display Access and Wireless Data Transfer, as well as Service Advisor Remote. For safe, intuitive and convenient operation, the sprayer features a Hydro Handle multi-functional control lever and Solution Command electronic sprayer control for automatic filling, mixing, spraying and rinsing as standard. Total spray pump capacity is a maximum of 560 litres/min with a flow of up to 380 litres/min to the steel spray booms, which are available in widths from 24 to 36m. The rounded shape of the 4000-litre polyethylene spray tank features a smooth internal surface for efficient solution mixing and fast automatic cleaning. Simply operated by a switch on the Solution Command panel, the new 50-litre PowrFill inductor safely transfers crop protection chemicals into the main tank. The pendulum boom suspension system includes polyurethane dampers for stability, while John Deere’s established BoomTrac automatic boom levelling system adds even more accuracy to the spraying operation. The new variable geometry BoomTrac Pro option further increases application accuracy and efficiency by automatically adjusting the height of the individual boom wings independently to match the terrain. Instant coverage to the full working width of the sprayer is provided by the standard pressure circulation system, which keeps the liquid solution moving along the stainless steel spray lines and right up to the nozzles even when not spraying. Once spraying starts, the system feeds the spray lines from both ends to maintain a constant pressure and application rate. To reduce input costs by minimising overlaps or skips, John Deere’s automatic Section Control switches individual boom sections on and off when entering or leaving predefined areas, including headlands, while LED boom lights help to maintain high productivity at night.